I am not a child nor do I have any children, but this children's book about pizza is maybe my favorite book I've read this year. 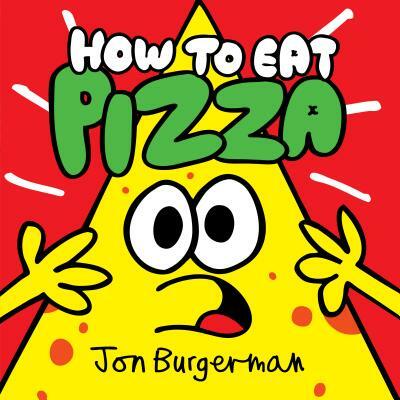 This could be because I just love pizza, but it could also be because Jon Burgerman's talking pizza slices are hilarious and adorable. How do you eat pizza? Do you pick the biggest slice? Add hot pepper flakes? Use your hands? Do you know how your pizza slice feels about that? He thinks it's disgusting. There are so many other things you could eat -- that aren't him. Listen up. He's got ideas. Bright, bold artwork and real-kid humor create a recipe for laugh-out-loud, finger-licking fun. Jon Burgerman is an award-winning artist, creating picture books like Splat! and Rhyme Crime, as well as murals, sculptures, toys, apparel, and posters. His art is collected by the Victoria and Albert Museum among others worldwide. Jon celebrates mistakes, experiments, and the unexpected, believing that through playful, creative acts, art can allow people to change their worlds. Born in the UK, he currently lives in Brooklyn with his wife and fellow artist, You Byun.